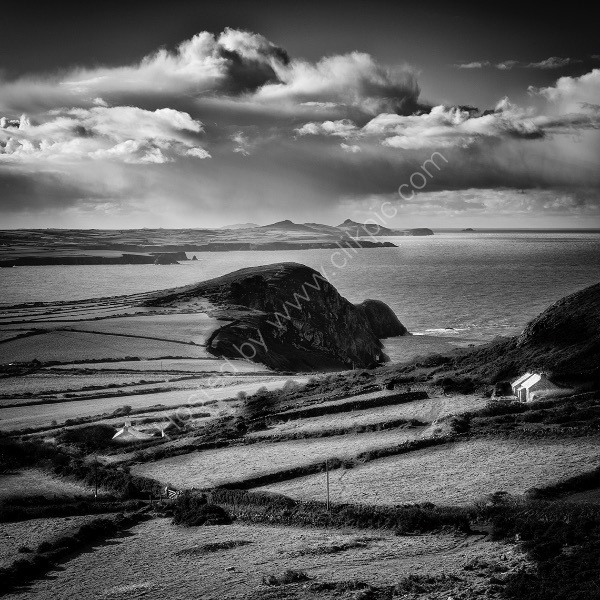 I was on the Pencaer Peninsula in North Pembrokeshire, photographing the buildings in the mid ground of this image. These are John Piper's cottage on the left, and his studio on the right. John Piper was a British artist who designed some of the stained glass in Coventry Cathedral, amongst many other works. As I was photographing, I noticed a cloud bank building. I scrambled to the top of the rocky outcrop of Garn Fechan (it's a hands & knees job at the top! ), and waited in the biting December wind for a couple of hours as the clouds grew & grew. Then it started raining over St David's Head in the distance, with the beautiful (to my eyes!) hump backed shape of Penbwchdy in the mid ground. I love this image! To me, it looks like something out of Tolkien!